The online search giant says most of its revenue comes from small companies - and it needs more of your business. Should you hire it? Online retailer Polly Liu doubled her Google AdWords spending - and her sales. 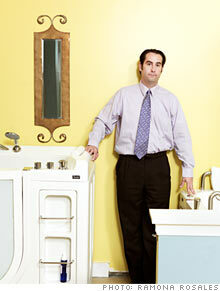 Justin Short-Campo had little success selling his bathroom fittings via Google. The search giant's gravy train is slowing like the rest of the economy. Here are a few frills staffers will have to do without, and some still-sweet perks they get to keep. MOUNTAIN VIEW, Calif. (Fortune Small Business) -- Last September, Polly Liu started having serious doubts about her wedding favors company, Beau-coup.com. During the previous six years, Liu, 36, had grown the online-only retailer into a 30-employee, $10-million-a-year operation. But with the economy entering a miserable patch, she wasn't sure it made sense to stay in a business that catered expensive happy occasions. Instead of firing staff or cutting product lines, Liu decided to go for broke. She increased her spending on Google (GOOG, Fortune 500)'s AdWords service, which places those targeted text ads that the world's most popular search engine serves up alongside its results. Liu had begun using AdWords soon after Google - based down the road from her office in Mountain View, Calif. - released it in 2002. "It really helped us get off the ground," she says. "I'd always wanted to try it more, but we'd been too busy." For the next six months, Liu increased her AdWords spending to more than $25,000 a month, twice its previous level. She bought more search result keywords, such as "tea party favors" and "Las Vegas wedding favors." The outcome: Beau-coup's sales via AdWords doubled in the same period, while the amount Liu pays to bring each customer to the site has dropped by 20%. The company's overall growth was around 50%. Google, says Liu, is the main reason for the growth. "It's the only marketing channel we're putting more money into," she explains. Early-adopting small business owners like Liu are the main reason Google became the fastest-growing business in history, and the search company knows it. "They built us," says Fred Vallaeys, Google's AdWords evangelist. "We want to support them. We've set up the system to help them compete with the big guys." Google made a record $21 billion in revenue in 2008 - more than 95% of it from AdWords. That much is a familiar story; Google has been breaking its own records for years. Less well known is that small businesses make up most of its clients and revenue. "Any way you slice it, they're the majority," says Vallaeys. Now, to maintain growth in a downturn, Google is tweaking AdWords to make it more appealing to the average entrepreneur and thereby keeping the company far ahead of the competition (mostly Microsoft (MSFT, Fortune 500) and Yahoo (YHOO, Fortune 500)). Whether those entrepreneurs will continue to sign up at the same rate is an open question. AdWords certainly isn't for everyone. Companies looking to build long-term brand recognition rather than drive short-term sales tend to put their Internet marketing dollars into traditional banner ads. Businesses that want to send more foot traffic to a real-world store than to a Web site usually do better advertising on Citysearch or Yelp. "It's really the branding that drives people to Google," says Karsten Weide, a market analyst who covers search advertising at research firm IDC (IDC). "They're the Kleenex of search." Google knows that it needs to diversify. So in a riskier play, the company is trying to push its brand into nonmarketing parts of your business. It now sells a software-as-a-service suite called Apps; the bundle includes a version of Gmail for your internal e-mail and Google Docs to let you collaborate on text and spreadsheets, all hosted on Google's servers. Unlike the groundbreaking AdWords, this paid version of Apps came late to the party. Online productivity apps compete in a crowded market - and Google isn't putting sales boots on the ground to pitch the suite, as it does with AdWords. Then again, the company didn't need a sales force to turn AdWords into a cash cow in the first place. David Fischer, now a Google vice president, arrived at the company in 2002 to run the new unit. Based on the success of existing competitors, he recalls, "We said, 'Wow, one day there may be 100,000 advertisers you could get into this.'" Although Google won't release user numbers today, Fischer chuckles at his initial projections. "We were orders of magnitude off," he says. "We hadn't anticipated how much pent-up demand there was." The model was simple and, at the time, revolutionary. Before Google, most online advertisers still used the classic system known as cost per mille (CPM), where you pay for every 1,000 Web users who see the page on which an ad appears. This has the dual effect of driving business and building a brand. Google's response, called pay per click (PPC), took advantage of the billions of search results pages it serves up every month (5 billion at last count) and the anonymous information it collects about its users, such as their whereabouts. Businesses could place small, basic text ads alongside millions of Web pages, tied to whatever search terms they chose. They could even specify the time of day and the location of the user. AdWords customers would pay only when users clicked on their ads and went to their Websites. The price per click for keywords depended on their popularity, from a few cents up to $100. Most cost - and still cost - $1 or less. These days, AdWords is not alone. Its two major PPC rivals are Yahoo Search Marketing and Microsoft adCenter. Their per-click prices are similar to Google's. All three offer roughly the same features, but Google's rivals serve up far fewer pages - Google alone claims more than 63.3% of the domestic search market, with Yahoo at about 20.6% and Microsoft accounting for 8.2%, according to research firm comScore. "The main reason Google is better is that it has more traffic," Weide of IDC says. "For some small businesses that volume is important. Others could run their ads just as well on Yahoo or Microsoft." He recommends that businesses try all three for a couple of months. Liu uses all three services, but just 20% of her budget goes to Yahoo and Microsoft. Not only do customers click through to her Web site faster via Google, she says, but they also spend more when they get there. Of course, getting customers to click on a Web site doesn't guarantee that they will buy a product. 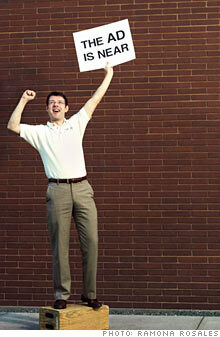 That was the experience of Justin Short-Campo, 34, managing partner at JRD Steam and Bath in Denver. In October, Short-Campo hired a local firm called Net Return Marketing to run a national AdWords campaign for his business, which sells walk-in baths and showers for seniors and people with disabilities. Thousands of Google users filled out query forms on Short-Campo's Web sites. He spent the next month making calls and sending brochures to potential customers. But few of those leads turned into sales. Nationwide prospects, he discovered, were more likely to buy from their nearest showroom. "It seemed like people were getting educated," says Short-Campo. "But when it came time to purchase, we were losing business to local contractors, even though we were less expensive." AdWords, although easy enough to use, is hardly one size fits all. Different businesses will face varying challenges, says Anna Florey, president of Net Return. "Even professionals can't expect to succeed 100% of the time," she adds. Short-Campo is considering giving AdWords another try, but next time limiting it to users who Google can tell are in Colorado and surrounding states. Negative stories like Short-Campo's help explain why Google hired Vallaeys, the AdWords evangelist. He logged 150,000 air miles in coach last year - "Google doesn't fly me business class," he notes ruefully - visiting small business bureaus and associations. Interestingly, he often advises customers to cut down on their AdWords spending. For example, Vallaeys recommends buying a keyword for no more than a month, because Google's research shows that around 80% of click-throughs happen in the first 30 days of a campaign. Google seems obsessed with turning its customers into ad scientists. "Measure it and track what you're doing," insists Google VP Fischer. "If it's working, double down, and if it's not, stop." To help customers measure the success of their online marketing campaigns, the company has released a flurry of free tools in the past three years. Website Optimizer helps test different versions of a Web page. Google Insights for Search tracks how the interests of visitors to a Website change over time. Conversion Optimizer automates cost-trimming strategies within AdWords. The company also offers a service called "broadmatching," which automatically buys keywords that are semantically similar to the ones chosen - "chalet" as well as "bungalow," for example. Then there's Google Analytics, a free Web site-monitoring tool with a record of helping companies improve their business models, even if they don't use AdWords. Bonobos, a high-end menswear retailer based in New York City, was surprised to discover through Analytics that most of its customers were coming to the site via Facebook. Sales skyrocketed after Bonobos retooled the site's design to appeal to a younger and hipper demographic. Liu used keyword research to explore new markets before expanding into baby products in 2006. She then used traffic from AdWords to help determine the best-selling products in the channel, such as cookies and mint tins for baby showers. Baby products now account for almost half of her sales. "I wouldn't be able to run my business without Analytics," she enthuses. "Anytime we launch anything, it's the best tool for us to gauge the impact." The one Google product Liu isn't fully on board with yet is Apps, Google's hosted productivity suite. She does pay for Apps, which costs $50 per employee annually, but so far the only feature her company is using is the paid version of Gmail. This provides e-mail addresses with a company's name after the @ sign, as well as word processing and spreadsheets with the ability to add advanced password protection or designate that a given document be e-mailed only within the company. The bundle also includes Google Video, a service that has been retooled to help companies share training videos and video messages on an internal Website. Google Apps project manager Rajen Seth calls it "YouTube in a suit." The Apps customer base numbers about a million paying companies that together employ more than 10 million people. But the business is small by Google standards, bringing in less than a billion dollars a year. The entire Apps division numbers 700 employees out of Google's total head count of 20,000. "We don't have our feet on the street the way Microsoft Office does," Seth admits. That's why the company is enlisting local IT firms to resell Google Apps to their customers, sweetening the deal with a 20% discount. Apps seems to be most popular with virtual companies such as Science Approach, a Tucson-based education company with seven full-time staffers and 40 consultants and contributors scattered around the country. But even there the transition from Office to Apps "hasn't been smooth," says CEO Steven Moore, 52. Google Docs lets users collaborate on a file and look at previous versions of it at the same time. That excited some employees, while others had trouble figuring out the new system. "That's been a drawback," Moore says. "They get confused." The more Google Apps builds its user base, say its competitors, the more room it creates for them. "After [Google Apps] entered the market, our share increased," says Raju Vegesna, product evangelist for Zoho, which sells 19 online productivity applications, including Zoho Mail, Zoho Writer and Zoho CRM. Today Zoho has about 1.5 million users, the company says. Microsoft is responding to the threat with Office Live, a free service that lets you access Word and Excel documents from any computer. Once again Google and Microsoft find themselves elbow to elbow in the same market. And again small firms will decide the outcome.